More often than not, an indicator changes direction before the price. These phenomena are commonly referred to as bullish/bearish divergences, and have usually been very good predictors of impending price moves. 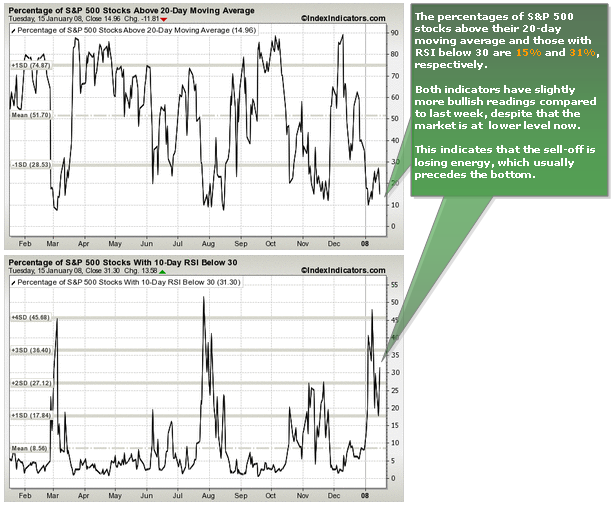 Yesterday, a number of breadth indicators registered slightly more bullish readings relative to last week. This is despite the market making a new low relative to last week, which is a bullish divergence. Yesterday could have been the bottom or we could see more divergences lasting a few more days. At any rate, this means that less stocks are participating in the decline, which one would expect to see before an upward reversal in the index. Ahh…thanks for pointing out the divergences. I have been watching the % of stocks above their 200-MA for a possible wash out (below 20%). It’s close.